This trip to Montgomery Potrero started like many things do: in a bar, over drinks. Several coworkers and I were sitting around chatting, and, as most conversations with me go, it turned to hiking and the outdoors. All three of us were experienced backpackers and were eager to go out into the wilderness together. Within two days of us discussing this, I sent out an invitation for a 3-day backpacking trip to Montgomery Potrero, a place I've been itching to do as an overnight trip, but, since I normally don't do overnight trips solo, I had been saving for sharing with friends. A few days after that, while chatting with a previous coworker, he expressed interest in joining us and we had our Montgomery 4. Myself, Possum, Tenderfoot, and Jeffro. There can suddenly be a bit more pressure when organizing a group trip. When I am hiking alone, if I make a wrong turn or choice, I can correct easily and no one will ever know. With a group, I needed to make sure everyone was safe and capable of the distances we intended to go. Also, as I have learned on group backpacking trips, people invariably bring duplicate items. I tried to minimize this by dividing us into two groups so we could share items and only bring what our group needed. I reached out to some very helpful friends who tend to have great information on water and trail conditions. I discovered we could not rely on any springs in the area to have water, which was not really a surprise, since we had a record low rainfall this winter. Result: we would be carrying a lot of water. We got a nice and early start, having some coffee at Full of Beans Coffee House in Ojai at around 6AM. We loaded our stuff into my car and headed north to the Aliso Park Campground. We made sure we had a cache of liquids in the car, so we had something to look forward to on the way back. On the way, we had plenty of laughs and shared some great stories. We would be getting along just fine. Once at the campground, we met a guy living in a questionable RV, who offered us tea. He seemed nice enough, but we were eager to get on the trail. According to our calculations, we needed to hike around 10.5 miles before our day would be over, and each of us were carrying 6-7 liters of water. 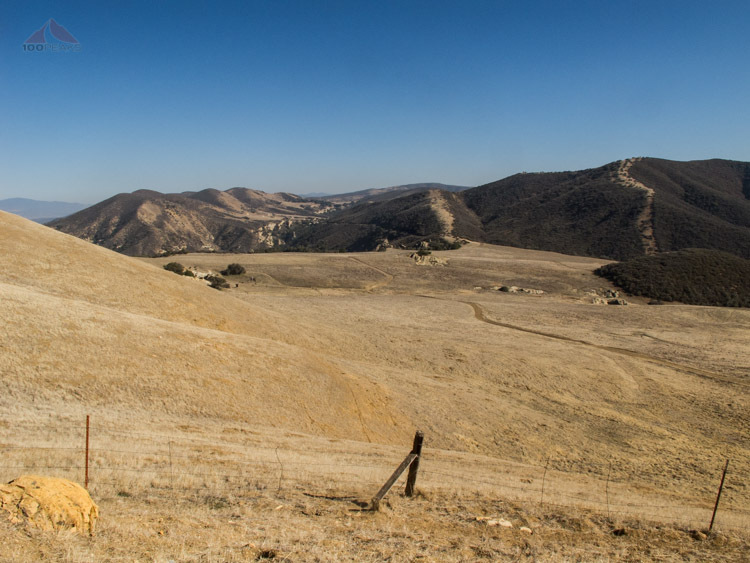 The Aliso Canyon Trail is an old dirt road, which still appeared mostly navigable. It wasn't until later, when I was reviewing the maps, that I realized that it may have been possible to shave up to 4 miles off our trip if we were to drive all the way up to Hog Pen Campground. As we were chatting, we missed the trail that leads to Sierra Madre Ridge. It's pretty easy to miss as you make your way up the canyon. If you've come to Hog Pen Spring, you've gone too far. I checked my GPS app and we backtracked a bit and found a narrow trail leading upward to the left. 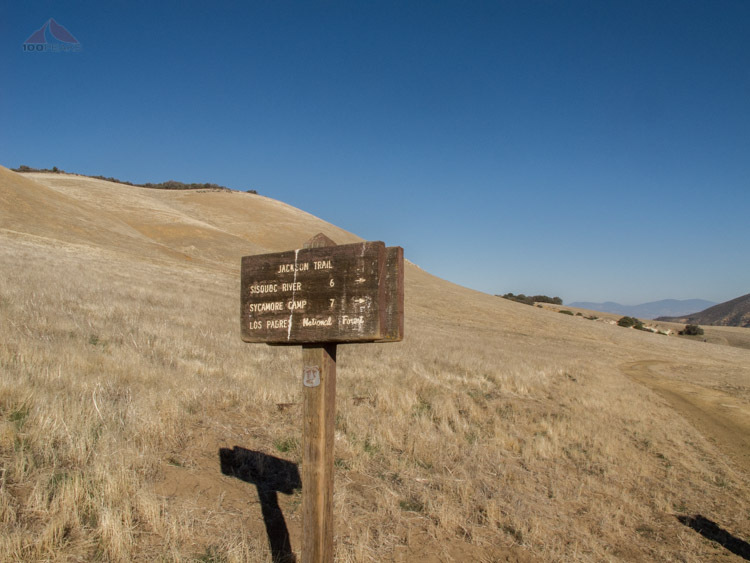 The trail rose immediately out of Aliso Canyon as it followed long switchbacks up to the ridge. An occasional tick check came up positive as the day warmed up. We counted switchbacks while sharing stories and having snacks. Making it to the ridge was a nice little victory and we relished the wide Sierra Madre Road as we turned left and hiked toward Montgomery Potrero. We were ready to break for lunch and found a nice wide spot off the road and looked over Mine Canyon and beyond. I liked the pace. It was nice to take off our loaded packs and have a proper lunch. Possum, who is a vegetarian, brought the best variety of food, mostly being fresh fruit and other hearty selections. I nibbled on my bars and trail mix, convincing myself that my lighter pack weight as worth it. Once again, we shared our experiences and laughter as we hiked the slight ups and downs of Sierra Madre Road, which was riddled with tracks from all sorts of animals. We could see the snow-capped Southern Sierra far to the north and the chaparral-covered ridges of Los Padres National Forest to the south. While preparing for the trip, I had thought about bagging some of the benchmarks along the way, but the idea of adding mileage onto an already long day with heavy packs wasn't appealing once I was doing it. After seeing a deer scampering up the side of the trail, we could see Salisbury Potrero and some interesting rock formations and knew we were getting close. The entrance into Montgomery Potrero is pretty grand. One second you are walking on a wide dirt road on the top of a ridge, and the next you are overlooking a large open grassland. We made our way down into the pasture land and got to Painted Rock Campsite, which has a picnic bench, a pit toilet, and several campsites under several trees to the east. We set our packs down and climbed up some rocks to rest. I may have drifted off to sleep for a bit; the pale winter sun was warm enough to completely relax me. After setting up our tents (in the open areas since we wanted sun in the morning) and having a snack, I set out across Montgomery Potrero to assess the water situation. My legs were pretty tired, but I wanted to explore this peaceful valley. And I was worried about being thirsty later. I strolled southward from the campsite, enjoying the breeze as the sun started making its way behind the mountains. I investigated some rocks for additional Chumash art, but anything I found was questionable. I came across a trough that has some green plants growing in it, but it was flowing. I pulled out the hose that fed the trough and let the water flow onto my hand. It was clear, and it smelled good. Just a little sediment from the bottom of the trough. I designated this one as a possibility if the other springs didn't pan out. I pulled out my map and headed westward, searching for the next spring. I walked right past it before I knew what it was. It was so completely dry, I hasn't even realized that it ever could have been a spring. I had to get out my map and criss cross that area before I came to the conclusion that this broken trough was what I was seeking. Determined to assess the other two, I continued on westward, toward a cabin we saw as we entered the valley. In the sign-in register for the San Rafael Wilderness, I saw a few familiar names who had been in the area just the past week. I made it mostly to the cabin before I realized that night was falling and it was getting chilly. I was underdressed. I made my way back to the campsite, having to gain a little elevation in the process. My legs were a little tired; my day's total mileage would hover around 12. I was met by Jeffro and Tenderfoot, who had started to worry about where I was. I assured them I was fine and we went back to camp and made some dinner. Tired and satiated, we assembled under the stars and went to sleep early. Some of us may have had wine. The next morning, I was first to get up. I loved the feeling of having a silent valley, all to myself. I climbed the rocks behind us and had a commanding view as the sun edged its way into our world. We had breakfast and planned our layover day. We decided to check out the two springs I hadn't found yet and see what condition they were in. We went westward and inspected the cabin. It had a sink, but no running water. There was an upper floor, but no safe way to see what was up there. It would work in a pinch, but we were pretty comfortable in our tents. We found a spring, but I assured the others in our group the the first one I found was far better than this mossy mosquito farm. We went further south and came across a muddy green patch with a cow's carcass in it. This was the final spring. None of us were going near this one with our water bottles. We decided to head over to the first spring that I had found, cutting across a small shoulder behind the large hill south of the campsite. It was a pleasant, rolling hike, and, aside from the evidence of past cow grazing and some bones, we all felt pretty remote out there. We made it to the spring and everyone agreed that this one was good enough for our purposes. Jeffro and I perfected our process of filtering the water from the hose through a bandana and then using my Steripen. The water tasted great and we gulped it down, filling our water bottles. The sun was out with a pleasant breeze. There was the sound of birds chirping in the trees surrounding the spring. A solid stripe of green followed the path of water down the drainage. We sat there a while, filling up water bottles, appreciating the serenity of the area. We all agreed this was a special place and it became a highlight of the trip. We took our sweet time. We headed back to camp, both laden with and buoyed by fresh water. We encountered a couple on mountain bikes. They had come from Upper Oso Campground, a distance of around 25 miles as the crow flies. From what I remember, it was more like 50+ miles via the trails they took. And they were headed back. Quite a feat. 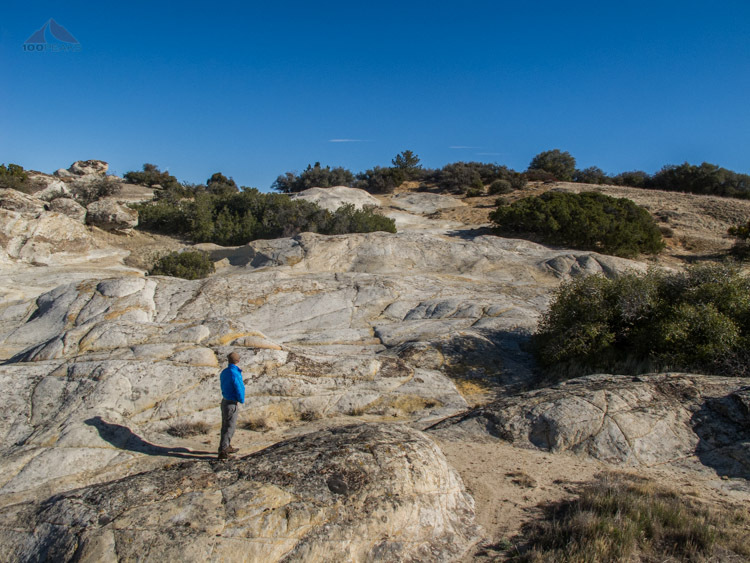 We decided to pack our lunches and head out to Lion Canyon, a large rocky cleft just east of Montgomery Potrero. We took the Rocky Ridge Trail up and over some grassy hills until the canyon came into view. The canyon was pretty scenic as we descended from the grasslands into the rocks. We came across a sheltered area with an overhang. Someone had gathered some firewood. The top of the overhang was blackened by fires from long ago. Once again, we sat and enjoyed each others' company, laughing often. And, once again, we felt comfortably remote. After eating, we scouted around for a way down into the canyon. We bushwhacked for a bit until we came to the edge of a box canyon. I could imagine a Chumash village down there. After sitting on the edge for a bit, we noticed the shadows lengthening and the temperature dropping. It was time to head back. We had another nice dinner with headlamps and the setting sun. Tenderfoot and I stayed up late chatting about all sorts of things. The next morning, it was time to say goodbye to Montgomery Portero. 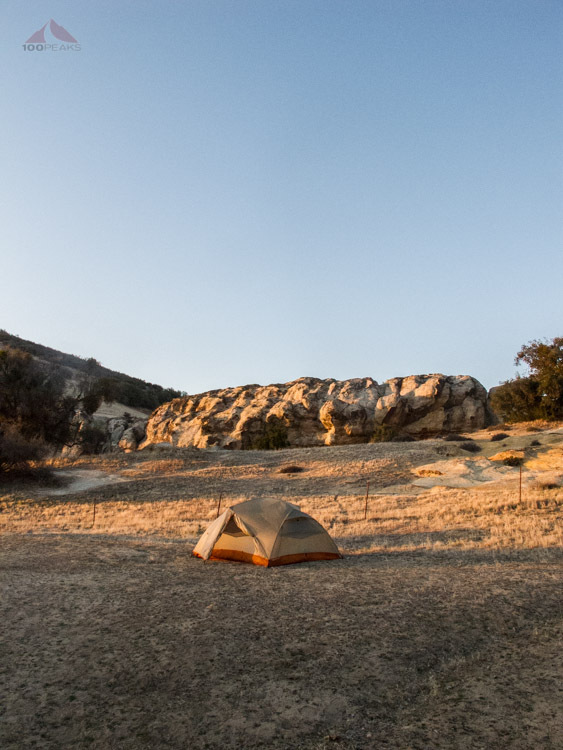 We all felt that it was a special place and was one of the more scenic places we've been to in Los Padres National Forest. We had a hike ahead of us, but according to our calculations, it should be shorter than on the way in. We planned on summiting McPherson Peak and taking the McPherson Peak Trail back down to Aliso Campground. We broke camp and headed back up to Sierra Madre Road. Our packs were noticeably lighter. Spirits were high and we were making great time. We stopped occasionally in the shade to get some rest, but hiked steadily until we reached the Aliso Canyon Trail. We made the group decision to continue to the peak. Sierra Madre Road constantly gains elevation in this area and we all started feeling the miles. Especially when the expected side trail to the peak didn't appear as expected. It wasn't until both Possum and I inspected our maps that we realized that we both had made the same error. 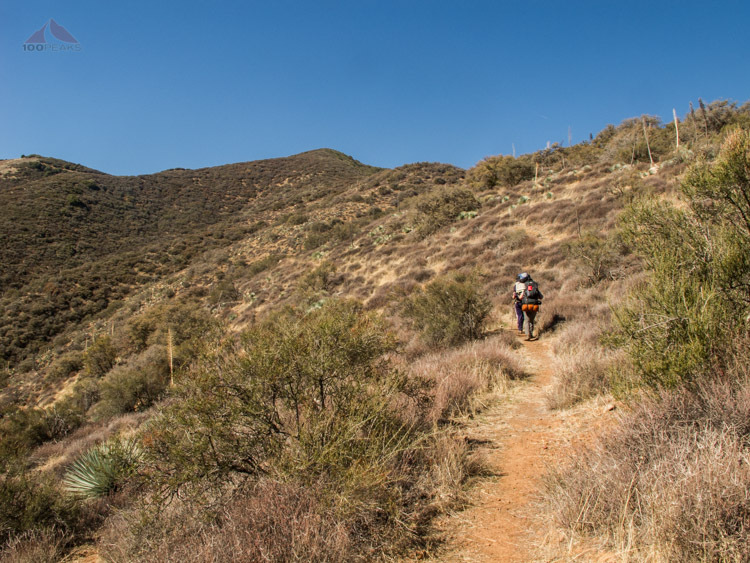 There were two ways to get to McPherson Peak from Sierra Madre Road and not only had we missed the first one, a faint cut in the hill over McPherson Corral, but we had both also neglected to add the mileage from the connector trail. When we reached McPherson Peak, we were happy, but a little trail-weary. Hiking on a wide dirt road in full sun can get to you after a while. Scouting along the summit, we found the McPherson Peak Trail, which looked pretty doable. We started descending and enjoyed a short shady section before we were immediately presented with a trail choked with scrub oak. Jagged leaves and branches tore at our exposed skin and our full-sized packs. After about a quarter mile down, we decided that, shortcut or no, this would not be our way down. We turn around and ascended steeply back to the McPherson Peak. Two summits in one day! On our way back down the dirt road, we saw the old overgrown road that leads down to McPherson Corral. We didn't want any unknowns at this point, so we stayed on the dirt road. We were tired and ready to be done hiking, but we had far to go. We were still in good spirits and made the best of it as we made it back to the Aliso Canyon Trail and started the switchbacks down to the canyon. A couple of us ran out of water on the way down, as the day was pretty warm. With what seemed like an endless hike back to the car, on what was supposed to be a shorter day, we ended up hiking 16.5 miles, for an overall mileage of around 33.5 miles for the trip. We dropped our packs and doffed our shoes. We refilled on beer and gatorade. We were pretty tired, but happy to be done and happy to have done it with this group of people. We had Burger Barn to look forward to. We piled into the car and headed back to civilization. 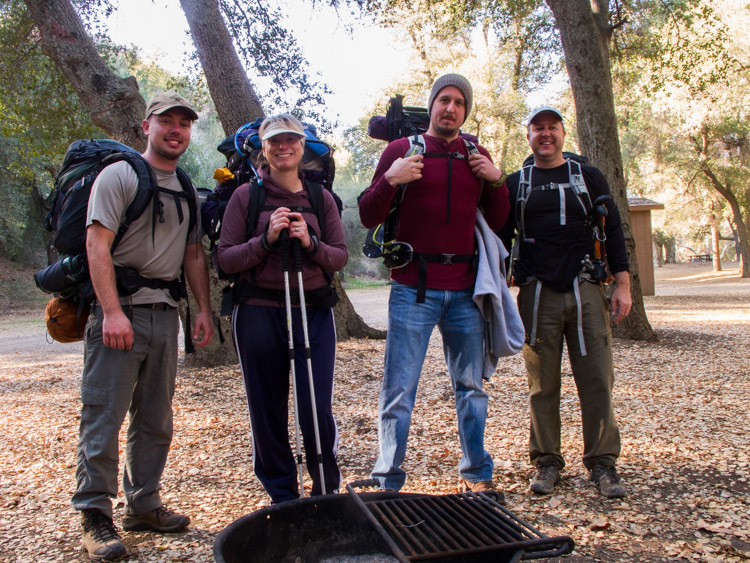 That's the one thing about backpacking that few seem to write about, the camaraderie. We all supported each other through any challenges and worked together to make sure we all had a great time. While driving down the hill, with the windows open, it could have been the beer or the challenging trip, or a combination of the two, but Possum said, loudly, "I love you guys!" We all felt it, too.